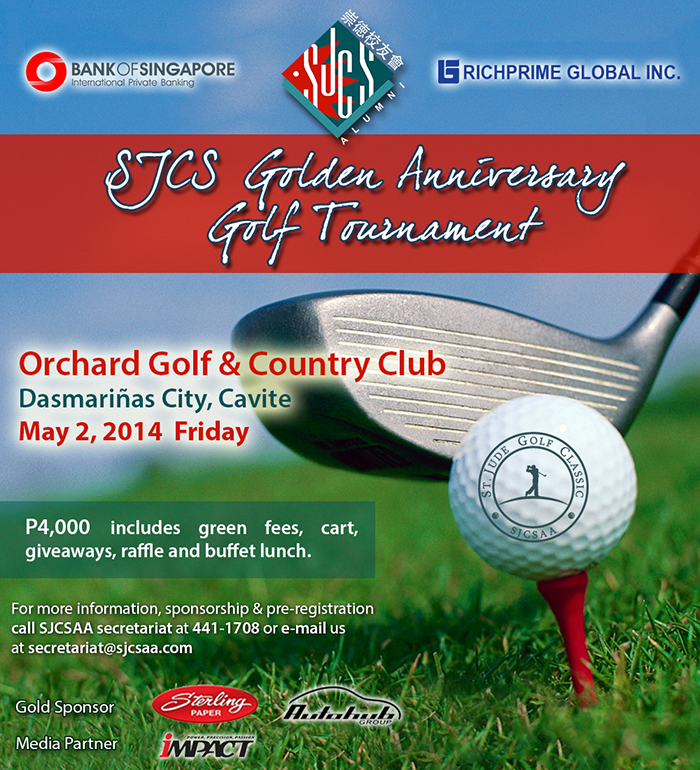 SJCSAA marked its first successful fundraising event for the year with the Golden Anniversary Golf Tournament held last May 2, 2014 at the Orchard Golf & Country Club. Still exciting and vibrant on its 13th year, the Saint Jude Golf Classic welcomed 105 alumni and guests golfers to a day of golf. Sports Committee Chairman Giovanni Co and Golf Committee Chairman Charles Kohchet-Chua welcomed the registrants as early as 5:30 am. It was a day of celebrating fun, camaraderie and goodwill among alumni golfers and friends. The tournament officially started at 8:00am after the ceremonial tee-off by SJCSAA President Liza Yao, Board Member Grant Cheng, and St. Jude Golf Classic Co-Chairman Gerry Lim Bon Hiong. The luncheon that followed was festive with all the golfers in a happy mood after a round of golf with friends amid the summer heat. Members and guests cheered as major and minor raffle prizes were awarded. Practically everyone went home with prizes. Guest Ken Chen won the 40” Samsung TV and Dr. Jerry Ngu ’82 won the iPad mini. Mr. Marvin Caparros and Mr. Jeff Bernaldez were the Lowest Net and Lowest Gross champions respectively. Biggest cheers went to Batch ’83 as the Overall Batch Champion of this year’s Saint Jude Golf Classic. Coming in their matching Tanduay Fiery Red uniforms, Batch ’83 golfers led by Bong Tan, Cons Kohchet-Chua, Wilbert Tan, Peter Sy, Cary Tuiseng, Bobby Lua, and Nelson Chung, continued their winning streak as 4-peat champions with an aggregate net score of 284. And promising to put up a better fight next year, Batch ’97 finished closely behind with an aggregate net score of 304. The game was played in several divisions as alumni and guests showed their golf prowess with many hitting record scores that day. Special awards were given to Jerboa Go ‘02 who registered the longest drive at 310 yards. Most accurate drive went to Architect Adones Baluyot with 1” to the line and Elmer Ngo ‘89 won the fun hole prize of Nearest the Pin, at 4’8” to the pin. “The Golden Anniversary Golf Tournament was a record-breaking success, both in player attendance and in funds raised! We couldn’t have made this tournament a success without the willingness to contribute and the close cooperation of each committee member. Special mentions go to our very own Pres. Liza for generously sharing her office and staff for our logistic meetings. Not to mention, hauling in almost half of our sponsors from her friends and suppliers. My Co-Chair Gerry for donating most of the major raffle prizes and for actively helping out in the awarding ceremonies and spearheading the Ceremonial Tee-off while I was still busy with the registration. Our Sports Committee Chair Giovanni and our Treasurer Maleen for seamlessly helping out in the early morning registration. Kudos still to my VP counterpart Stephen, who had been remotely monitoring, giving instructions to his office staff and getting major sponsors coming in, even at the last minute and at half-way round the world at that! During the crucial month of April, Maleen, Giovanni, Stephen, Liza and I were abroad on different occasions with myself arriving a day just before the tournament. So, anybody can just imagine, how challenging it was organizing a tournament with the prime movers alternately out of the country. Fortunately, with the help of modern communication, we were all in constant coordination and everything fell into place on tournament day. All in all, my hats off to my committee members who have vastly contributed one way or the other to the success of our tournament. PP Edward who’s ever supportive, Elmer who never denies sponsorship requests, Benhur who has wide contacts and wise inputs, my brother Cons, Winston and the youngest member Jasper in getting more player attendance and sponsorships as well, and Albert for sponsoring. I am very happy, not only for the success of our St. Jude Golf Classic. Moreover, I am grateful for the opportunity to have worked with the best team ever! Everybody was able, willing and worked with conviction. We were all equals working together for a common goal! I’m looking forward to seeing you all next year! Thank you.“ according to SJCSAA VP-External and concurrent Golf Committee Chairman Charles Kohchet-Chua ‘80. The entire St. Jude Golf Classic Tournament Committee composed of Co-Chairman Gerry Lim Bon Hiong ’77, Vice-Chairman Albert Lee ’92, SJCSAA President Liza Yao ’91, SJCSAA VP-Internal Stephen Yu ’93, Sports Committee Chairman Giovanni Co ’88, Past President Edward Lim ’84, Benhur Go ’77, Constantine Kohchet-Chua’83, Elmer Ngo ’89, Winston Co ’94, Jasper Ong ’97, all worked tirelessly to ensure success in both fund-raising and player attendance. SJCSAA President Liza Yao thanked all the sponsors whose generosity and support will help fund the projects of the Alumni Association. The St. Jude Golf Classic would like to thank its Co-presentors Bank of Singapore and Richprime Global Inc.; Gold Sponsors Sterling Paper and Autohub; Silver Sponsors Ferna Corporation, SeaOil, A&A Securities, Goodyear Philippines, Mileage Asia Corporation, Cathay Pacific Steel Corporation, Paperland; Bronze Sponsors x1r, Sky Cable Corporation, Hanabishi, La Germania, BDO Private Bank, Asia Cargo, FastTrack ERP Solutions, Davies Paints, Spectrum Investments, Pioneer Insurance, Philstone, CMP Construction, AC Corporation, Viridian/Ortigas Company, Coach Concepts, Tanduay, Canon, Evoluzn, RizGolf, Pilipinas Golf Manufacturing, Kremlin & Flight168, etc., AutoHub Group of Companies and Sevie Oliva as Hole-in-One Sponsors and many more generous sponsors who made the tournament a success. Impact Golf Magazine and Chinoy TV are the official media partners of the SJCS Golden Anniversary Golf Tournament.